A total of 29 companions and the guests of Standish Chapter No 4955 assembled at Chorley Masonic Hall, along with Assistant to the Provincial Grand Principals Tony Hall to join in the installation of Ian Dawson and David Bishop. Unfortunately, Joe Hall, the third of the triumvirate was unable to be present so Terry Withington was the understudy for the evening. Pictured from left to right, are: Tony Hall congratulating the three principals, Terry Withington, Ian Dawson and Dave Bishop. The companions were treated to a delightful team effort of a ceremony, with all ranks of companions playing a part. 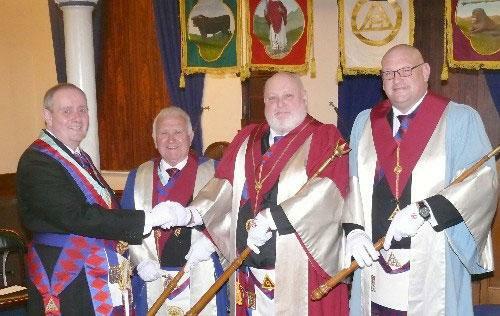 This clearly demonstrated that Standish Chapter is a chapter in which the companions support each other in the ritual to ensure that the installation is a memorable occasion for the new principals and all the companions present. Once the three principals were in place, Alan Green gave the robe address to the first principal and Malcolm Bell Snr give the robe address to the third principal. It was then reported that £700 had been presented to the MCF 2021 Festival which resulted in Malcolm Warren presenting a Patron’s certificate to the chapter. It was then disclosed that a further donation of £200 was going to be made to the local Scouts. The business of the evening being complete, all then retired to the ‘Provincial bar’ to toast the health of the three principals and to congratulate all those who had played a part in the ceremony. 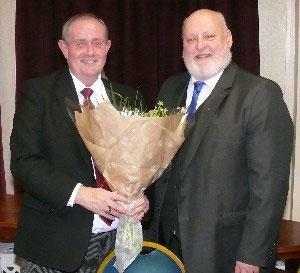 In another twist, all companions were invited to join the Provincial officers, a very much appreciated gesture. The companions then retired to the dining room to enjoy a meal and each other’s company. All to soon the conversations fell silent and the janitors toast was honoured before everyone began to make their way home, knowing that they had enjoyed a wonderful night at Standish Chapter. The three principals with grand and acting Provincial grand officers.